Nothing says fall like a pumpkin and QKR Stampede has some really nice images of them. I used the Pumpkin Vine image and colored it in with Copic markers. 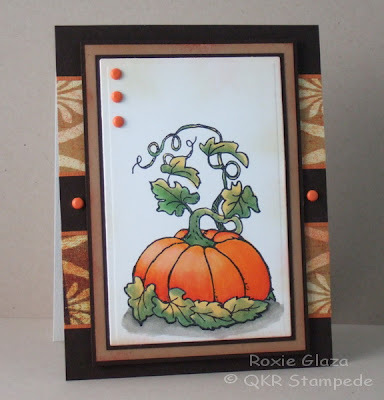 I did some faux borders on this card with the light orange and that involves cutting 1/16” strips and gluing them to the card which saved on paper as well and bulk when mailing. 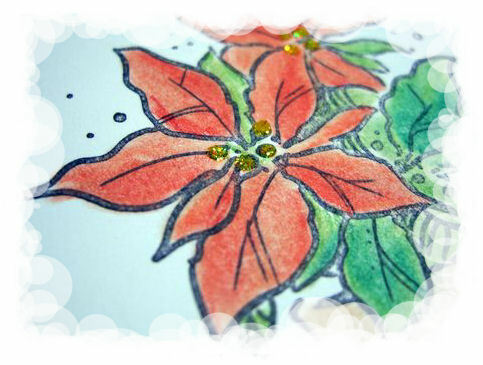 The bottom leaves were cut out and placed on ¼” circles of cardstock that act as my pop dots so they could add a little dimension to the card. Since part of the designer paper had a red distressed look to it I used Ranger Distress Ink barn red to add distressing to other areas and also antique paper to the image panel and tea dye with the already used red sponge for the Kraft border. Yes, I have the kitchen sink- Hopefully mine never looks like this! 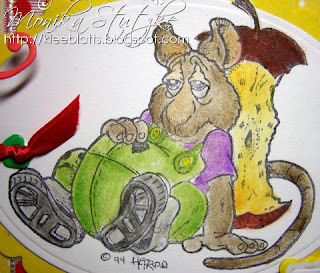 I found this hilarious image at Eureka Stamps- now who would appreciate a funny card with this image. I think a crafty person will totally understand the humor. I colored with Copic- I actually stamped twice and fussy cut a few pieces like the note and red pot. Wanted to share a close up of the extra embellishments I added to the twine and ric rac on the front. You never know what you can find at Eureka Stamps- so many new items being added all the time. Hi there. 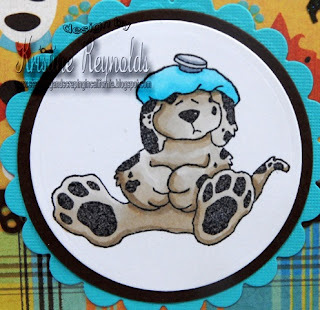 Today I wanted to share a card with you using the Nurse Stamp from QKR Stampede. I stamped her on white CS, and colored with markers. I layered onto various papers from Nikki Sivils Get Well collection. I added some ribbon, little pearls, and then the sentiment. 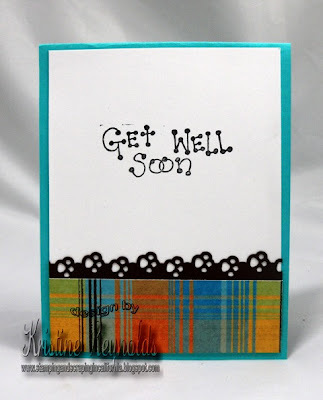 The sentiment is also a stamp from QKR Stampede called Get Well. Well that is all for now...short and sweet...lol. Have a great Thursday! I love this Santa from Eureka, he is so much fun and he comes in two sizes, you can see on the envelope has the smaller size and you can also get them in digital images. The card pretty much speaks for itself from viewing it other than you can’t really tell that the house roofs, sky flakes and ground area are glittered using a VersaMark pen and Sticky Powder for adhesive and Crystal Glitter Ritz. The snowflakes and tiny star on the exclamation mark are glittered paper attached with Aleene’s tacky glue. Aleene’s tacky glue was also used to attach the Flower Soft Polar White to the fur of Santa’s suit. A very light application of chalks was applied to the house fronts using a blender pen. Today's card is from Biblical Impressions. I added color with colored pencils blended with mineral spirits. I masked the words so that I could place them where I wanted them. Have a wonderful - stamping filled day! I've been working on my stash of Get Well cards this month and this is one of the last ones I made. I hope I won't need it but like to have a few on hand for when I do! I just love this cute "sick puppy". He goes perfectly with the sentiment! Here's a close up of this cute little guy. And here's an inside look. I used Get Well Soon which is available at Eureka Stamps sister company, QKR Stampede. Hi there. Today is my dad's birthday, so I wanted to make him something special. A couple years back, I went to a convention and volunteered, therefore getting all sorts of free stuff! So...one of the things I had picked up was a set of mini board books. Well, I have only used 1 of them in the past couple years. I decided to pull another one out for my dad's birthday gift. I started by using the Lg. Scribble Heart stamp from Biblical Impressions. Something neat about this image is it comes in 3 different sizes, so if the one I showed here is too big for your needs, there are 2 smaller sizes. For this project, I stamped the heart using versamark, and embossed it with Sticky Powder. 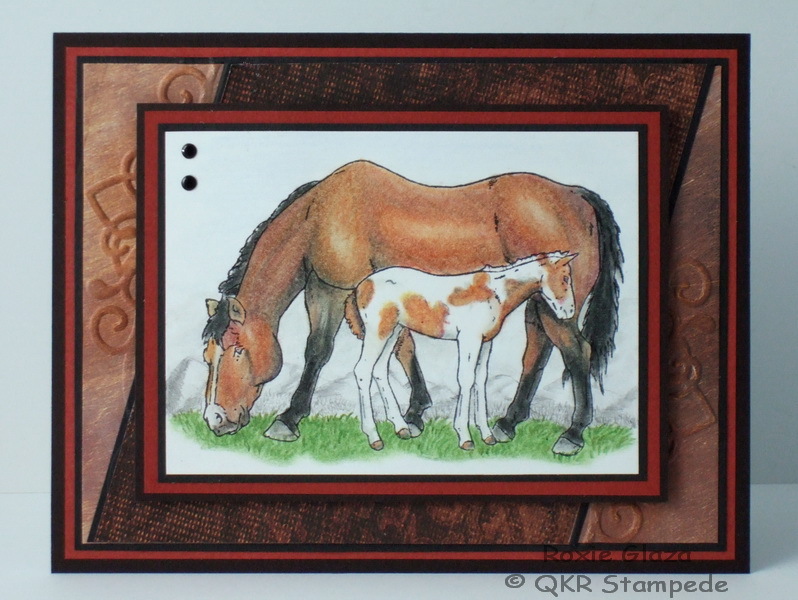 Next, I used some of the rub-on foils that are available from our sister company QKR Stampede. The first time I played with the rub-on foils was at the convention in August. They really are pretty neat to play with. While playing, one of the customers asked what would happen if you "re-heat" the foils after you put them on. Well for kicks, I tried it that day. One thing we did notice was it raises it up just a little bit. So I did that this time with this heart. I then took the finished heart and layered it onto the cover of the book. The words on the bottom are stickers. ALl the papers and stickers came with the books as a set. I did add something to the first page, but that was as far as I got...lol. I thought I would give it to my dad, and have him show me what photos he wants in there, and I will then add them. Well that is all for now. Have a great day! 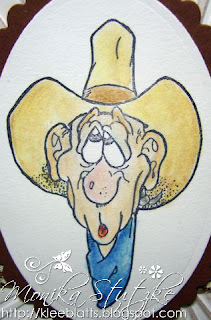 QKR Stampede - "Whistling Cowboy"
Today you get no Christmas card from me but a birthday card to see. I do not know whom I will give it, but I found the picture so funny and I had to digest it easily. The saying "Du bist nicht alt, du bist ein Klassiker" is in english "You're not old, you're a classic". The stamp is from the shop QKR Stampede, the name of the stamp ist Whistling Cowboy. 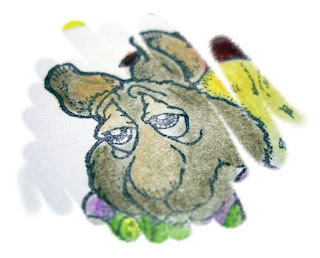 This stamp and many other you can buy as rubber stamp or digi-stamp. I think this card would work for the guys of any age or even a welcome for a new baby boy, the boat is the Biblical Impressions image – 81001 Toy Boat and 91303 Squiggle was used on the bottom edge which also involved the masking technique. All layers were ink distressed with water based ink. Cuttlebug Tiny Tags die was used to cut the maroon faux brads and they are covered with Aleene’s Paper Glaze to create a shiny finish. The light panel going across the card was embossed using the Fiskars Ocean plate. I have been working on my Get Well Card stash and have another one to share with you today. I made this with the Nurse image from QKR Stampede. 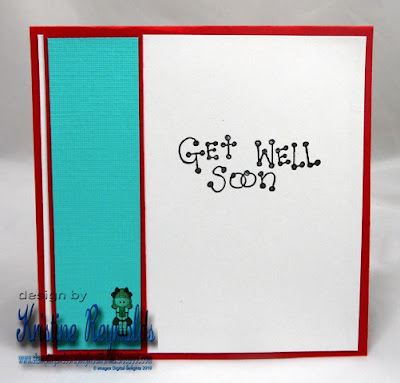 Yesterday QKR Stampede had a blog hop that featured Get Well cards so if you are in need of more inspiration make sure you hop on through it! 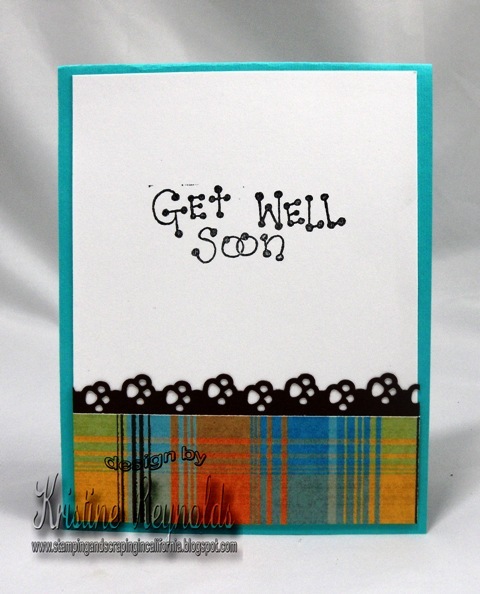 Hopefully, you won't need any Get Well cards but when you do they are great to have on hand! Now there are not even 10 weeks to Christmas and it's time to think of this seasons. Who has not tinkered cards should now start thinking about it. I'm almost done with the Christmas cards. 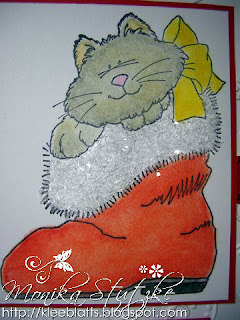 Today I will show you once again a card with a Christmas Kitten from the stamp shop Eureka stamps. The name from the image is Lg Kitty in Boot. 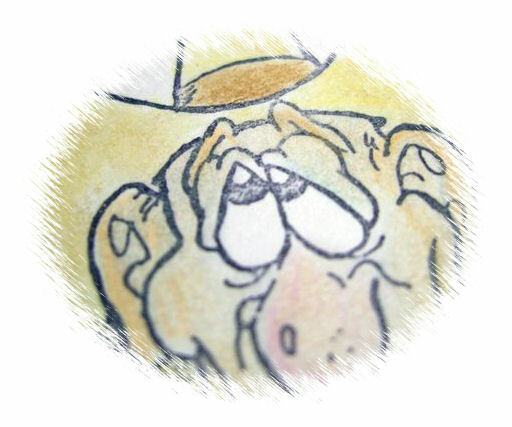 This stamp and many other you can buy as rubber stamp or digi-stamp. HI there, and welcome to the QKR Stampede Blog Hop! The official start time is 6am EST Friday 10/21..so if you arrived a little early, please be patient as we get all the kinks worked out. Our theme this time around is Get Well or Encouragement. We thought it would be fun to feature some of the stamps in this category. The Design Team ladies have some awesome projects in store for you, so we don't want to hold you up here. A complete hop order can be found below in case you get "lost". So sit back, grab a cup of coffee, and enjoy the hop! 6. Back HERE to let us know your favorite project! The week is nearly done! I haven't had much time to stamp this week because I am busy playing catch up at work after taking care of hubby the last couple of weeks but I still have a card to share. I made this baby card a couple of months ago for Maribeth's Eureka Stamps display board that she takes to the stamp shows. 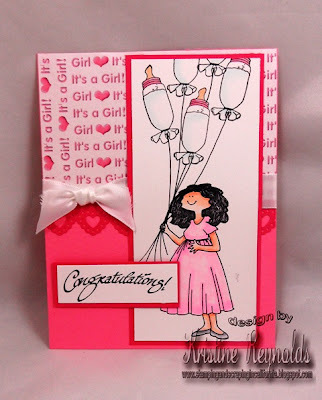 I just love these bottle balloons that I paired with the Expectant Mom Balloon holder. There are so many fun Balloon stamps and holders in the Eureka Store so I hope you'll stop by and check them out! It'll be hard to choose...so you may need to start a wish list! Thanks for stopping by for some inspiration today! with Distress inks, then I stamped the image in black. 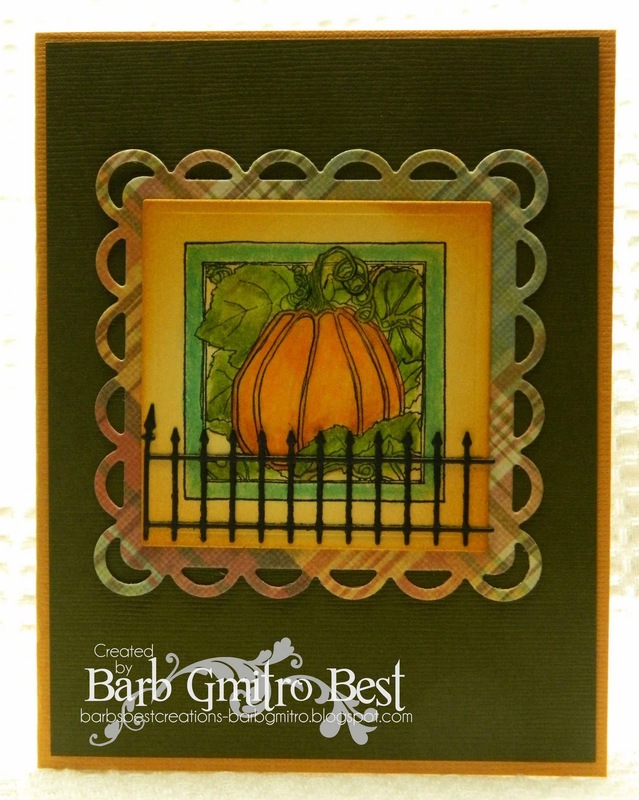 The wrought iron fence is a die cut from Memory Box. HI there. Wow...my creativity seems to have left me months ago, and not coming back...lol. I have not been happy with anything coming out of my craftroom lately. BUT...I am trying...lol. Anyway today I wanted to share a card I made using the Cat-r-Pillar stamp from Eureka Stamps. So when I ordered this stamp, I kinda missed the part that says how big it is...lol. But that is okay...I just love it! Some of the other Eureka DT ladies have been sharing the Dog Pile Stamp, so I decided to share the kitty version of it with you. Both images are very tall, but absolutely adorable. I stamped this image, and then colored with watercolor crayons. Next I layered onto some green CS. The PP I found in my stash and thought went perfect with the lights on the stamp. For the base I used some red CS. On the inside I stamped the Piled High Christmas sentiment. It goes perfect with this stamp and the dog stamp. If you like the piled animals, there is also a piled Bunny Stamp. The bunnies are more spring themed, but just as cute! Thanks for stopping by! And again, a weekend passed and on it goes on to Christmas. Why are racing against time before Christmas as quickly? 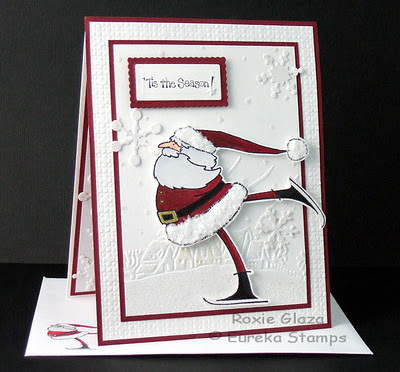 Today there is therefore again a Christmas card and the whole style of clean and simple. The stamp is a image of the Shop Biblical Impressions. 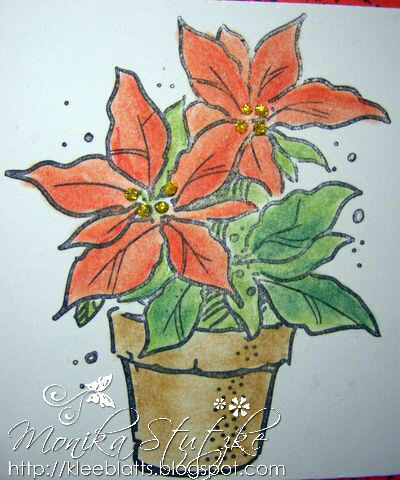 The name of the stamp Poinsettia Plant. 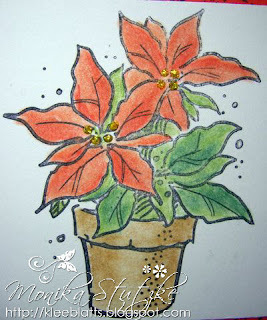 Today I have a quick card to share, it is one I made with a couple stamps one from Eureka Stamps. I have had these in my supplies. Rubber Stamp Catalog. This is from QKR Stampede Craft Words background. After stamping each of these stamps-I used my copics to color the little girl, then I used my generator to airbrush the background. The girl shape was cut with a Spellbinder die and matted with another size. Gems and ribbon are from my stash. Have you checked out all the background stamps available at Eureka Stamps? There is a new set of one Full sheet stamps you really should check out .I have my eyes on a few of them. You have approximately 60 days to complete them! Well....actually less if you want them to arrive at their destination before Christmas. 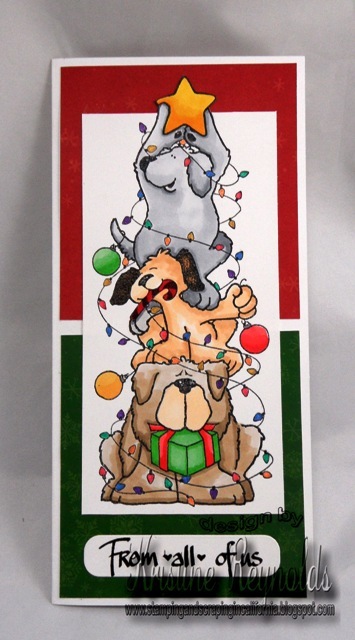 I'm not sure I would use this image for a all my cards because it takes awhile to color-especially the lights...but this Dog Pile image by Eureka Stamps is so adorable that you'll want to use it for your favorite dog lovers cards! This image is rather large (6.25" tall) so I made an 8" x 4" card. Here's a close up of the image. I colored the lights with Spica pens for a little sparkle. I hope you loved this card as much as I do!!! It is time for me to share another great design using Eureka Stamps- this is probably one of the quickest and easiest cards I have made. Decided to share a couple versions of the same design.This background stamp is Legend of the Butterfly, so perfect for a Christmas card, but I chose to group it with Large Lacey Butterfly and use it as a Thinking of you type card. If you would like more details you can pop over to my blog and see those there. So have you started your Christmas cards yet? 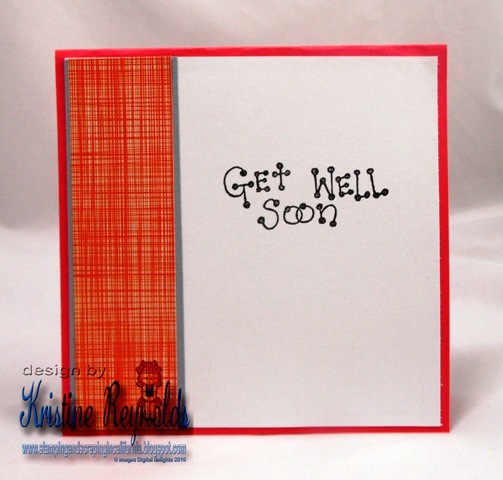 Pop over and check out some great Background stamps to copy this design. Maybe you are looking for a more traditional type Christmas stamp for your cards, check out this link at Eureka Stamps. Eureka has added so many new products to their supplies. flexible silicone craft molds Mulberry Paper Flowers Metallic Powers, Micas, and Earth Pigments Thanks for stopping, always enjoy your comments. Hi there and thanks for stopping by! It's time for our monthly blog hop from the Biblical impressions DT. Our theme this month is Encouragement/Friendship and our DT has some awesome eye candy to share with you. I have listed the lineup for the hop below so if you get lost along the way just come back here. Mare and Foal from QKR Stampede. I colored the image with Prismacolor pencils, then I used an ordinary graphite pencil and drew the freehand distant ground and mountains, the green grass is freehand also – not a part of the image. The Flourish Frame embossing folder from Cuttlebug was used for the embossing design. I sponged the embossing to make it stand out and also to cover some white that appeared from the embossing. The nailheads are attached with Aleene’s Paper Glaze. The image panel and borders are mounted to the card with foam squares. This is a card front for the image company to use for card displays at shows…or I’d do an envelope and insert. 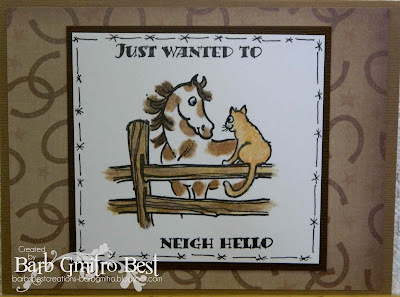 So today I knew I wanted to share a card with you I made using the Rose Stamp from QKR Stampede....but I had 2 of them that I LOVE, and couldn't decide which to share. So...I thought I would share both. What I like is they are the same color scheme pretty much on both, but look so very different. So here is the first one... 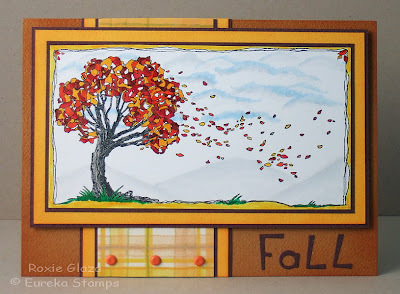 This card was made using paper piecing. I stamped the rose on both white CS and the PP from Echo Park. Then I paper pieced the flower and the leaves. I used a marker to color in the rest of the stem and small leaves. Next, I used a stipple brush to go around the rose with olive ink. 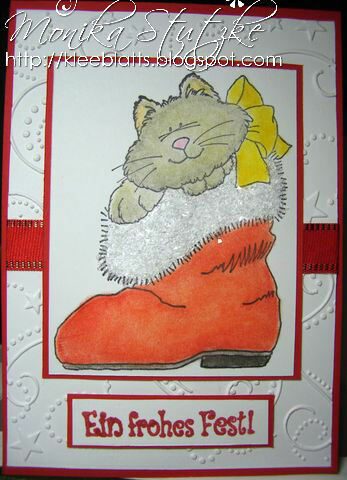 As you can see I then went a little crazy and did the entire card with the stipple brush...lol. I added some olive ribbon and use the Anniversary Sentiment from the Happy Birthday Stamp set. For my 2nd card using this stamp I "darkened" things up a bit. I started by stamping the Rose Stamp on white CS. I then used markers to color it in. Then I grabbed the stipple brush (since it was still sitting on my table calling my name), and went to town with black ink this time. I layered onto some PP from Echo Park. For the ribbon, I wanted pink ribbon, but I felt the pink was just too bright as it was, so I ran the ribbon along the top of my ink pad. I loved the results! (Of course my fingers were a little inky, but hey...lol) Last, I added some pink FlowerSoft to the petals of the rose. See...same stamp...2 totally different looks! Thanks for stopping by! 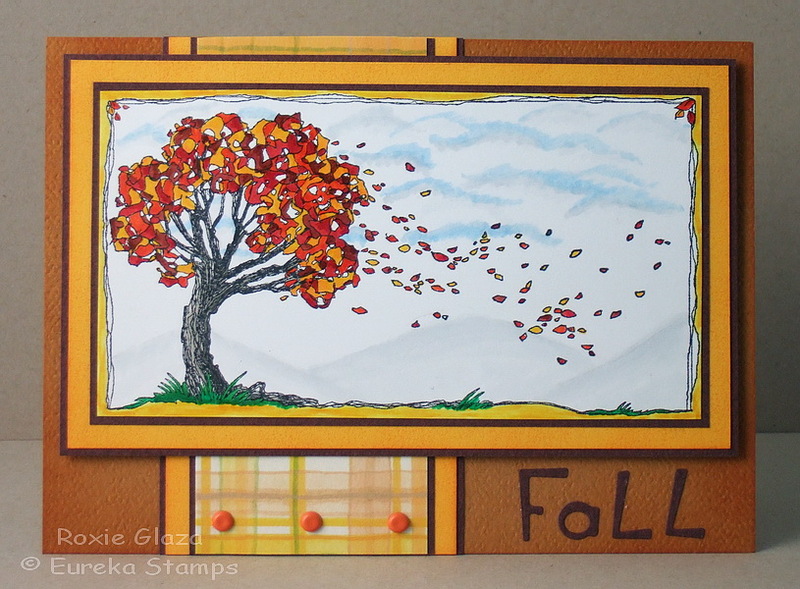 This fall scene is from Eureka - 34502 Tree Losing Leaves and I made the card size 4.50" x 6.25"
Ink distressing was done on the mustard base and the yellow panels. The Fall letters were attached with Aleene’s tacky glue. The image panel is mounted on foam squares. I have an adorable Christmas card to show you today. 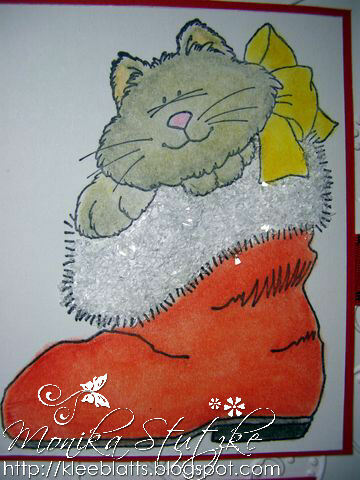 I made this card with "Dog Pile" (#17703) and "Piled High Christmas" (#23302) from Eureka! Stamps. I stamped the image onto water color paper and colored it with water color crayons. I used some Stickles on the star and ornaments and some Glossy Accents on the ribbon on the gift. 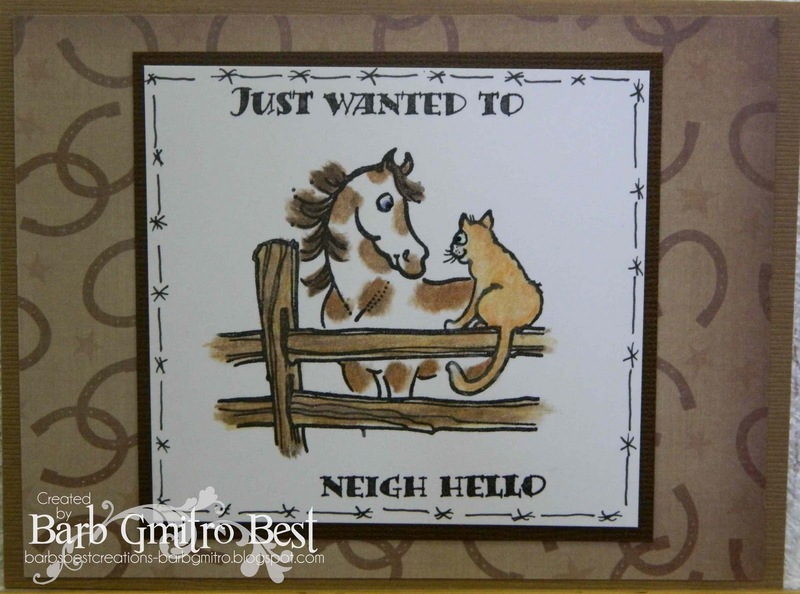 The inside sentiment was stamped with black ink and layered onto colored card stock to give it a little pop. There are many wonderful images in the Eureka! Stamps store, whether you are looking for dogs, Christmas or both or maybe some thing else. Hop on over and see what Eureka! Stamps has to offer. I'm sure you will find something you just love! Thanks for stopping by today, come again soon! Hi there. Today I wanted to share a quick simple card I made using 2 stamps from Biblical Impressions. Like I said...very simple...lol. 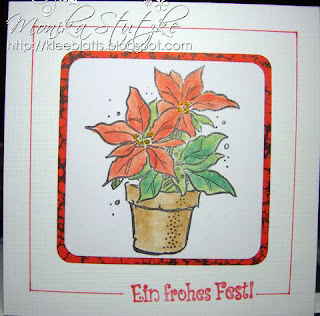 I started by stamping the Babys Breath stamp with versamark and embossing with white. Next I layered that piece of purple CS onto some green. Then i pulled out some polka dot green and purple, and layered those onto the base. 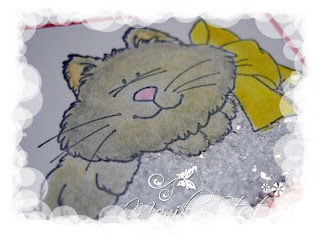 For the sentiment, I used the Be Still stamp, and also embossed that with white. Well that is pretty much it...very simple, but a great card for encouraging someone in a tough spot. QKR Stampede - "Happy Tummy "
A girlfriend of mine is celebration her birthday in the next week. Her's name in the www-net is Apple. 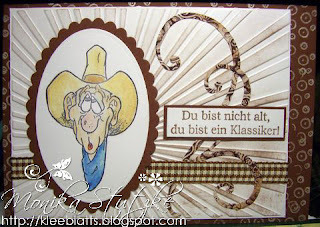 As I now saw this sweet stamp image from the shop QKR Stampede, I knew that I do her a birthday card with this image. The little guy is too cute. The name of the image is "Happy Tummy". This stamp and many other you can buy as rubber stamp or digi-stamp. 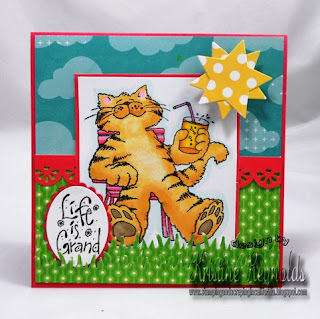 Hi there, and welcome to the Eureka Stamps Cats and Dogs Blog Hop! The official start time of the hop is 8am EST 10/10...so if you arrived a little early, please bare with us while we get everything up and running perfect for you. 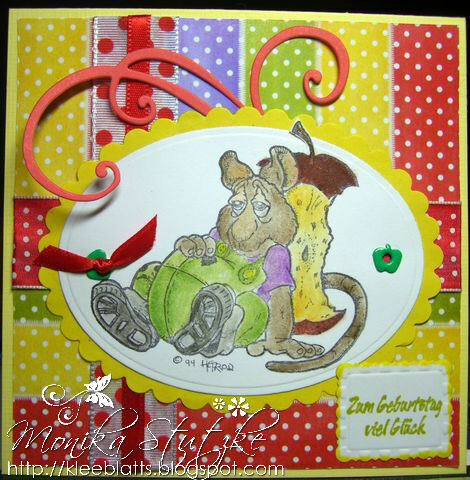 We are going to start you off with a fun card created by our very talented Kristine. 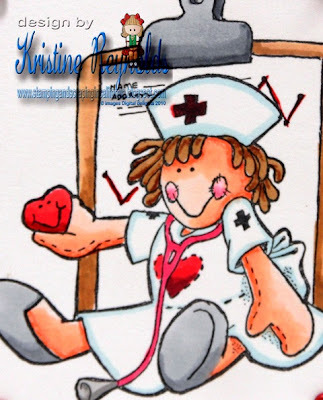 Isn't this card adorable????!!! 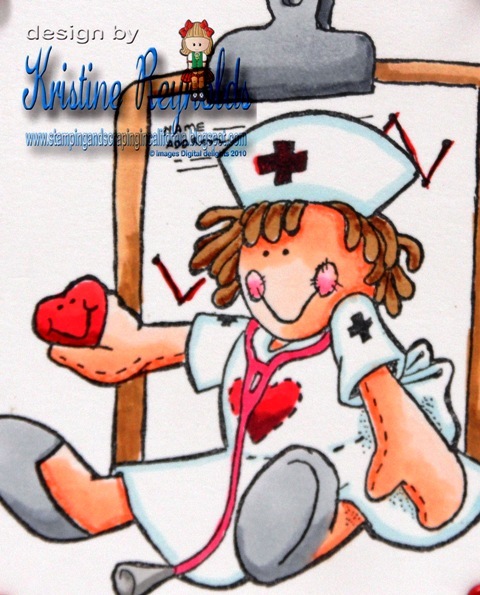 Kristine had another event on her personal blog today, but we really wanted to share her awesome card with you. Here is all the details about her card for you. If at any point during the hop you get "lost", just head right back here and you will find the complete hop order below. Have a wonderful time! Lately it seems like I've been needing get well cards for different people and different reasons. It always seems like it goes in spurts like that so I've been working on building up my stash of get well cards again. Here's a close up look at the image. I colored her with Copic Markers. And...I've been trying to be better about finishing the insides of my cards while the scraps are still laying around on my table so here is the inside of my card. Thanks for stopping by today for a little inspiration.